FILE - Fishing boats are docked in Tho Quang port, Danang, Vietnam, March 26, 2016. Fishermen from around the South China Sea tell stories of contending with bandits and coast guards. China’s toughest rivals in a maritime sovereignty dispute are defying an extra-strict fishing moratorium declared by Beijing this year in the contested South China Sea, putting their own trawling fleets at risk of arrest. Beijing declared the moratorium on its own from May 1 for three months, 30 days longer than in previous years and restricting more types of fishing operations. It covers the South China Sea above the 12th parallel north of the equator. Taiwan, Vietnam and the Philippines claim waters inside the moratorium zone but did not agree with China to pause fishing. Vietnam has condemned the moratorium while the Philippines, which held upbeat talks with China on their maritime disputes last month, has kept quiet, analysts believe, to avoid legitimizing the ban. Taiwan gives awards to fishing boat operators who impose their own moratorium and will help anyone caught by China. 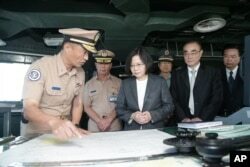 In this image taken and made available by the Taiwan Presidential Office, Taiwan's President Tsai Ing-wen (center right) reviews nautical charts aboard a Taiwan Navy ship before it sets out to patrol in the South China Sea. “Our fisheries agency in the past has sought fishing parties to warn them about safety matters involved with mainland China’s moratorium,” Chiu Chui-cheng, spokesman for the Taiwan government’s Mainland Affairs Council said. Taiwanese boats are known for following blue-fish tuna in the South China Sea. The moratorium, after a world court tribunal ruled last year against Beijing’s claims much of the sea, casts new disdain on China around Asia while reminding other countries of the strength of Chinese de facto control. “It’s no use protesting (the moratorium), because you’re acknowledging that they’re imposing the ban, but on the ground fishermen know where to avoid,” said Termsak Chalermpalanupap, a fellow with the ISEAS Yusof Ihsak Institute in Singapore. Beijing has enforced previous seasonal South China Sea fishing curbs, the first of which it declared in 1995, by arresting foreign fishing boats. After so many years, veteran boat operators know where they can safely go, analysts say. China will check boats that it finds illegal and arrest any without a license, vessel name or port of registration, Taiwan’s Mainland Affairs Council says. But neither silence nor protests imply acceptance of a single country’s rule over the high seas, said Douglas Guilfoyle, associate international law professor at Monash University in Australia. High seas refers to waters outside the exclusive economic zones extending from the shores of coastal states. China claims most of the 3.5 million-square-kilometer sea, citing historic records as a basis. It has alarmed the other claimants by letting coast guard vessels operate in disputed waters and by building artificial islands, some for military deployments. The fishing moratorium violates a July world arbitration court ruling in The Hague against the legal basis for China’s claim over more than 90 percent of the South China Sea, analysts say. China has gone easy on Philippine fishing boats over the past year as the two governments try to settle their dispute. Negotiators met last month for what the Philippine side described as a productive first meeting, according to media reports from Manila. But Beijing routinely keeps Filipinos out of Scarborough Shoal, a prime fishing spot in Manila’s west coast exclusive economic zone, and boat operators know they can’t access it. Vietnam, which despite a year of stepped-up dialogue with Beijing, still resents China over historical sovereignty disputes, said in March it would send ships to protect its fishing vessels from action taken under the moratorium. The fishing boats will probably be detained, arrested or sunk as China sends its coast guard and maritime police, said Murray Hiebert, senior fellow at the Center for Strategic and International Studies think tank in Washington. China would arrest Vietnamese boats anyway, said Zhang Hongzhou, research fellow with the China Program at the S. Rajaratnam School of International Studies at Nanyang Technological University in Singapore. Countries dissatisfied with arrests can seek international arbitration at least to get a boat released, Guilfoyle said. The sea yields 16.6 million tons of fish every year and the fishing industry employs about 3.7 million people, a National Geographic report said last year, but fish stocks are declining. Claimant countries also prize the sea for its marine shipping lanes and reserves of gas and oil.